MOSCOW - Russia condemned a new round of US sanctions as illegal on Thursday and said it had begun working on retaliatory measures after news of the curbs pushed the rouble to two-year lows over fears Moscow was locked in a spiral of never-ending sanctions. Moscow has been trying with mixed success to improve battered US-Russia ties since Donald Trump won the White House in 2016, and Russia’s political elite was quick to chalk up a summit last month between Trump and Vladimir Putin as a victory. 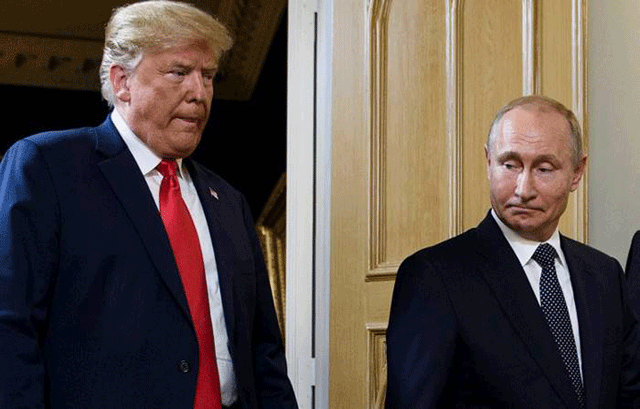 But initial triumphalism swiftly turned sour as anger over what some US lawmakers saw as an over deferential performance by Trump and his failure to confront Putin over Moscow’s alleged meddling in US politics galvanised a new sanctions push. Having bet heavily on improving ties with Washington via Trump, Moscow now finds that Trump is under mounting pressure from US lawmakers to show he is tough on Russia ahead of mid-term elections. In the latest broadside, the US State Department said on Wednesday it would impose fresh sanctions by the month’s end after determining that Moscow had used a nerve agent against a former Russian double agent, Sergei Skripal, and his daughter, Yulia, in Britain, something Moscow denies. The Kremlin said the sanctions were illegal and unfriendly and that the US move was at odds with the “constructive atmosphere” of Trump and Putin’s encounter in Helsinki. Moscow would start to work on retaliatory measures “in the same spirit” as any US restrictions, the Foreign Ministry said. The new sanctions come in two tranches. The first, which targets US exports of sensitive national-security related goods, comes with deep exemptions and many of the items it covers have already been banned by previous restrictions. Foreign Ministry spokeswoman Maria Zakharova said Moscow had not yet received any official US request to open up sites once linked to chemical weapons for inspection. The State Department’s announcement fuelled already worsening investor sentiment about the possible impact of more sanctions on Russian assets and the rouble at one point slid by over 1% against the dollar, hitting a two-year low, before recouping some of its losses. The US move also triggered a sell-off in Russian government bonds and the dollar-denominated RTS index fell to its lowest since 11 April. Peskov criticised the US decision to link the sanctions to the British nerve agent case, an incident the Kremlin has long cast as a Western plot to damage its reputation and provide a pretext for more sanctions. “Sanctions are the US weapon of choice,” Trenin wrote on Twitter.